I'm eschewing the usual outdoors photograph for one of the late great Tom Weir. 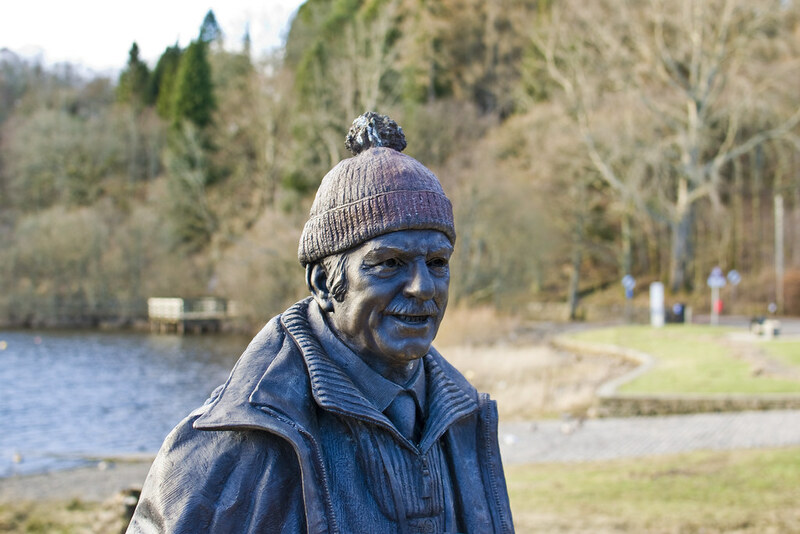 Who's recentstatue at Balmaha I visted this week. Broadcaster, writer, walker and climber. All around good guy. The great Weir's Way tv programme, you can't get much more inspiring than that. Getting out and walking the length and bridth of Scotland. Meeting the people and talking about the area and it's natural history. I have fond memories of that toorie bunnet and of watching Weir's Way on the TV. If you've never seen an episode then look them up or better yet click on the first link. You won't be disappointed. A good one to start with since I was talking about the inspirational Tom Weir. A selection of episodes on YouTube. As it says in the post, a grand day oot in the snaw. A classic snow day in Lowthers. Wanlockhead. This is one has a fine walk and folly to top it all off then off to the coast and some cracking see cliffs. Hill of Garvock and Arbroath Cliffs. Hopefully you enjoyed those links. Feel free to leave a comment, suggestion or feedback in the box below. Send me a message from the contact me page. Maybe even start a conversation over on Twitter?